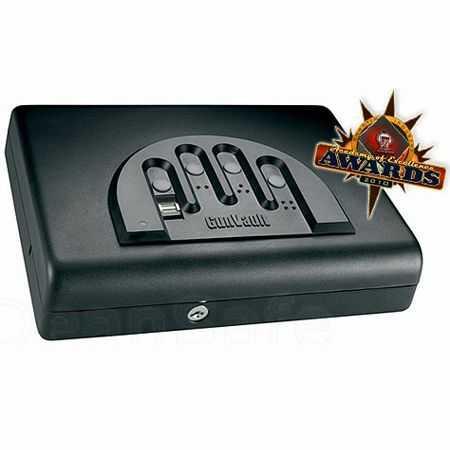 GunVault MicroBioVault MVB500 Biometric Handgun Safe - 17% Off! The biometrics let you access your weapon in complete darkness and stealth -- no need to turn on a light or fumble with a key! 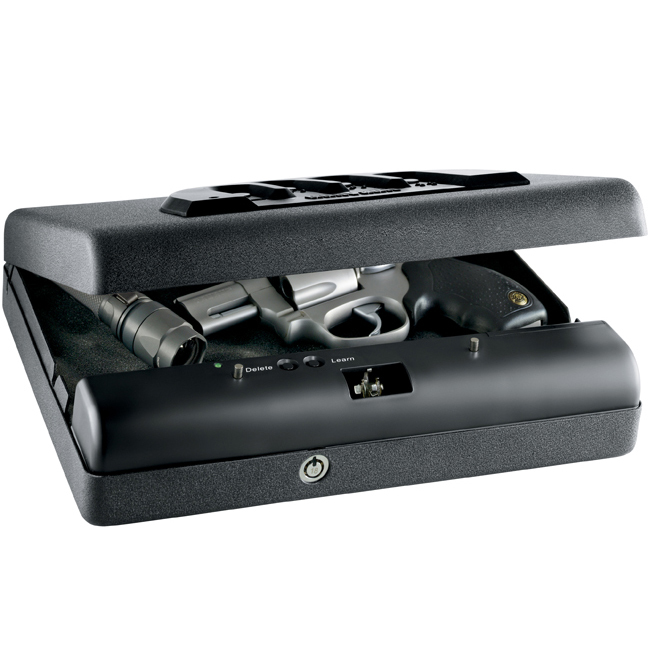 The Gunvault MicroBioVault MVB500 Pistol Safe is the ideal handgun safe for a bedside table and even won Safety Product of the Year! "Awarded "Safety Product of the Year" by the Shooting Industry Academy of Excellence, it’s hard to imagine you won’t love your GunVault MicroBioVault. But I guarantee your satisfaction anyway. I go way back with the GunVault people, and they let me borrow the first prototype to make this video. I'm still as excited about this fingerprint gun safe as I was on that day. 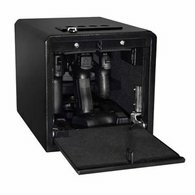 I'm impressed with the GunVault MVB-500 pistol box and I'm proud that we carry it. 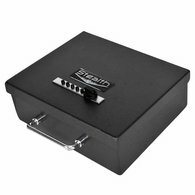 This GunVault is a smaller pistol box with a biometric lock and some key features and a great price that sets it apart from the rest. When people come into our stores looking for "the hand safe", I always know exactly which safe they mean. That's because the keypad on the MicroBioVault is a formed handprint with buttons at the tips of each finger. To open the safe, you simply put your finger on the keypad, right in the handprint, press the button under your index finger and slide it over the biometric sensor. Bingo, the safe pops open. You can enter up to 120 fingerprints. You probably won't need that many, but I do recommend that you enter a couple of prints from each hand. That's because you want to make sure you can open the safe in case you cut your finger or injure your hand. The locking mechanism on this unit is very interesting. It latches very similar to how the trunk of your car would lock. It's a little spring-loaded toggle that is considerably stronger than the camlock or little pins that devices of this size normally use. It's excellent. The hinge on the door has a non-removable pin. And you can't get a good angle of attack on it to remove it, which is pretty important in a security device. The body is a "formed" body, meaning they put a piece of steel between a male and female die, put it in a multi-ton press and it forms the metal in the same way that car body parts are made. Then they added reinforcement as needed. In my opinion GunVault got it right. There are much cheaper ways to make small gun safes, but they simply will not be as secure as a formed body. The paint on the MVB-500 is black electrostatic powder coat. It's tough and durable, has a nice tactile feel to it. The textured finish repels fingerprints and makes it easy to grip and carry as needed. This "handprint safe" comes with a cable that is very similar to the standing rigging I use on my sailboat. It's a brilliant idea and I wish I had thought of it. It's a very flexible cable about 48 inches, and it has a swagged loop on one end and a swagged stopper block on the other end. It's quite clever because they've reinforced the inside with a welded piece with a keyed hole in it. You move it down and push it through and it very firmly locks when you close the door. The cable loops around something like furniture, plumbing, or if you're traveling, on the trunk hinge of your car. Like I said, I've seen these cables on sailboats and they can be pulled and stretched and abused under thousands of pounds of pressure and still last for years. Can it be cut? Yes, but with some difficulty and certain tools are needed, and even then...the safe is still locked up tight! "Smash and grab" is out of the question. The feet, or holes, on the bottom are another clever idea I wish I had thought of. There are four holes drilled in the bottom with little rubber feet that snap in. If you're going to travel with it, you keep the feet in and it keeps it from sliding around. If not and you want to bolt it down a little more permanently, you just pop out the feet and you have the holes to bolt through. I'm surprised that more safes don't do that. This safe is really an ideal traveling companion. The inside has foam on the bottom that is glued in that goes across the hinge and covers the top to protect your piece. It also has a slide out egg-crate type piece of foam in case you have something that you want kind of squished in there for better protection. It works nicely, and also comes right out. For larger guns you might need to remove it. The Gun Vault MVB500 has rounded corners so you don't poke yourself on the hard edges. It's light-weight, only five pounds, so it's really easy to carry with you. Biometric locks have come a long way they first came out, and this one is very easy to program and use. I know that it will handle a 92 SBF and a couple of clips, and I also have a plastic replica of a Golden Eagle that it fits just fine. It's nice and snug but it doesn't touch any of the parts, and the clip fits pretty good, too. I think there is a lot of storage capacity for its size. That's because -- unlike some other "handgun safes" -- GunVault really designed the MVB-500 with guns in mind, not as an afterthought. They said, "Let's design a transportable biometric gun holder", and this is it. That doesn't mean you can't use it for other things. It will hold phones, a wallet, keys - it's actually perfect for the gym. 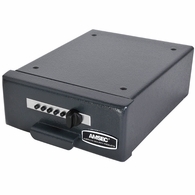 The "dirty little secret" about biometric gun safes is that for a long time, a lot of them weren't all that good. 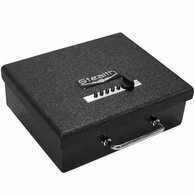 Even today, there are more than a few fingerprint safes that Dean Safe will never carry, simply because they don't work reliably. That's not a good thing when you need fast access to your weapon! Well, GunVault raised the bar with the MVB-500. 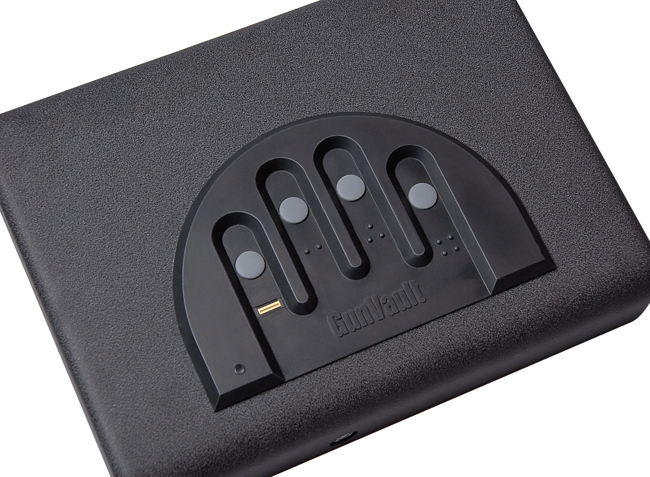 They created a fingerprint pistol safe that you can count on, and my family and I can stand behind. Fort Knox it's not, but it's great for protection against the opportunist who sees something lying there. That guy will get nowhere with this thing. It's also Department of Justice approved. I give this safe big points. Sometimes engineering beats raw steel thickness, and I think that this is a good example. It's secure without looking like a big ugly box that your wife makes you keep in the closet. 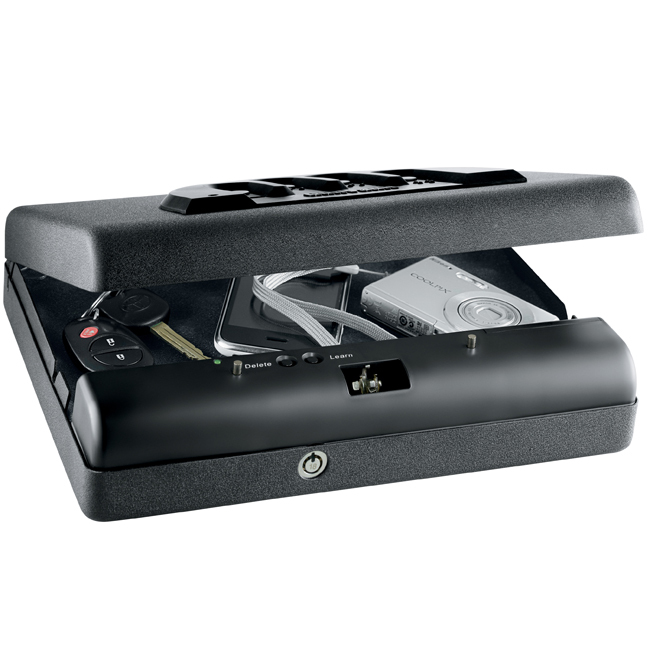 The MVB-500 is a real gunsafe, yet it can sit on your bedside table and look like it belongs. It's been a big seller for us, and it's a winner.